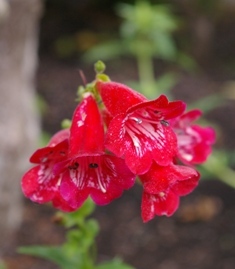 Joy Creek Photo Archive (c) all rights reserved Penstemon 'Flamingo' has large white-throated flowers with deep rosy lips. The upper lobes are very reflexed back over the white flower tube. All of this is shown off well by the somewhat stiff stems that hold the flowers up and out for viewing. Summer. 3 ft. x 2.5 ft.